As children enter adolescence, they stay grounded by focusing on core values. Middle School students are growing and changing physically, intellectually, socially and emotionally. They are forging an identity and beginning to wonder about their place in the world. 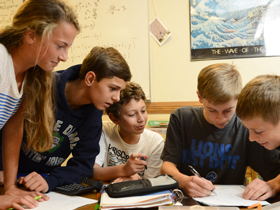 Educators at the Middle School, located on Blake's Hopkins campus, help some 340 students continue to thrive as they enter adolescence. Each year, students are matched with an advisor who serves as the primary contact for that student and family, providing invaluable support. Trust within the school community. These values color every aspect of students' day-to-day experience: classroom learning, athletic and artistic endeavors, service learning projects and cocurricular clubs and activities. Not only do students continue to set the highest standards for themselves – they also develop a greater sense of social responsibility. Early adolescence is an exciting period for children to discover what they can achieve. 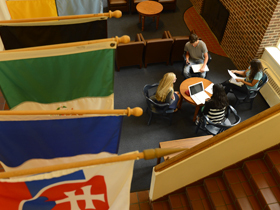 We provide numerous opportunities for students to excel as scholars, athletes and artists. Instruction in core academic subjects – English language arts, mathematics, social studies and science – places ever-greater emphasis on close reading, carefully crafted writing, critical thinking, social responsibility and creative problem-solving. Language study allows for students to build upon skills in Spanish or another new language. Physical education classes and organized athletics foster teamwork and leadership skills as well as fitness. A carefully planned arts rotation ensures that all students receive instruction in visual arts and theatre while pursuing music throughout Middle School. Budding orators may begin pursuing speech and debate, and all students give a public speech in grade eight. Get an inside look at the classrooms, labs, studios, theater and other spaces of Blake's Middle School. Click here for the tour. For details about curriculum requirements and specific courses, see our Middle School Curriculum Guide and pages for specific Areas of Study. Adolescents at Blake develop a deeper understanding of themselves as global citizens and community leaders, in and out of class. 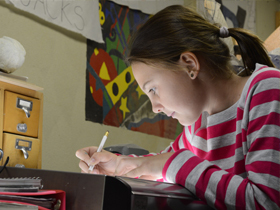 A sixth grader might craft well-reasoned arguments about global healthcare access for her Humanities course. A seventh grader in the BEAR environmental club might take action to help make his community greener. An eighth grader might lead a team to victory on the football field – or in a debate tournament. Whatever path students choose, they are guided by solid core values, a strong sense of purpose and a commitment to bettering themselves and their world.